Ahoy there! Tinyme personalized products are custom made to order (that's right, we don't hold stock of products with names such as Tigerlily or Apple). For delivery within the United States, Tinyme uses the trusty folks at the United States Postal Service in combination with Newgistics. We will make your order according to your specifications and deliver it to your door, typically within 11 working days. Feel free to select from the sub topics to learn more. Tinyme personalised products are custom made to order (that's right, we don't hold stock of products with names such as Tigerlilly or Apple). We will make your order according to your specifications before dispatching it. 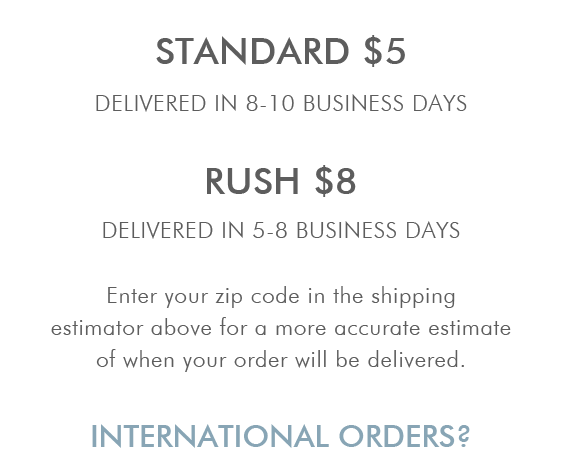 A more precise delivery estimate is available in the Cart or Checkout that is tailored to your zipcode. For a guide on how long it will take after placing your order until you receive the goods, see the table below. + Who do you use for delivery? If you are not at home when your order is delivered, your Postman will leave a note stating that you should collect your package from your nearest Post Office. + What if I’m not home during delivery? Please note that you can only start to track your order once the order has been despatched and we have sent you a despatch email. + Do you deliver internationally? We currently don’t offer international delivery from tinyme.com. If you love our products, you can find similar products at tinyme.com.au, with delivery to most parts of the globe. + Do You Offer Express Delivery? At present we don’t offer an Express Delivery option for your tinyme order. + Do You Deliver To PO Boxes? Yes, we deliver to PO Boxes anywhere in the United States. + Can I Pick My Order Up? Why would you want to when we can deliver it to your home? We don’t currently have a pick up option available.